This is NOT a spoiler-free review. In fact, in the next line I plan to spoil the entire plot of the game. Okay. So there's this princess, right? And she gets kidnapped by a giant dinosaur named Bowser. I know you're shocked by this. I was too. But luckily, help is on the way! Some guy named Mario – who is apparently a plumber – rescues her. It may sound familiar to you. At the moment, there are, as I would count them, three major lines of Mario games. First, and best-known, are the Mario sidescrollers, starting with Super Mario Brothers and continuing up through Super Paper Mario. Second are the roleplaying games, which I believe started with Super Mario RPG and somewhat branched with the Paper Mario series and Superstar Saga series. And last, there's the 3D exploration games, including Mario 64, Mario Sunshine, and Mario Galaxy. You'll notice a bit of confusion – I'm calling Super Paper Mario a sidescroller, but I'm also mentioning how the Paper Mario series is a roleplaying game. Super Paper Mario is an experimental intersection of sidescroller and roleplaying game. Nintendo has never been one to keep its games locked in tightly-defined precise boxes – Nintendo's built around fun. They make games which are fun, and if a certain convention gets in the way of making the game they want, the convention gets thrown away. For example: lush, spectacular graphics. Mario games don't have those. Their graphics certainly aren't bad. The art is always good, and it's always reasonably high-end by the standards of the console. But it's designed to be effective. it's not designed to be spectacular. it's not designed to be flashy. it's designed to convey how the world is constructed, and hold to a theme, and be consistent. All of which it succeeds at, quite nicely, but nobody will ever say "Oh man, did you see the latest Mario game? I didn't know video games could look like that!" We all knew video games could look like that. We saw it in the last Mario game. This one just has more triangles. So. "3D Exploration Game"? What's that? The Mario 64 series has a gameplay style which I honestly can't say I've seen in any other game ever. Your goal ("save the princess") is governed by a very simple game mechanic: a series of things you must collect. In Mario 64 it was stars. In Mario Galaxy, well, it's stars. 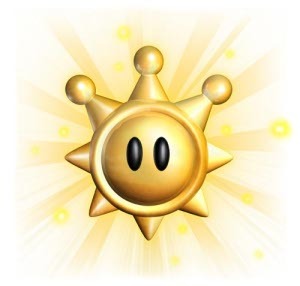 In Mario Sunshine you had to defeat Shadow Marios, and the way you got to them was by collecting "shines" . . . which look exactly like stars. The game inevitably consists of a number of major areas – from seven up to around fifteen – and each one contains a number of stars, generally from six to eight. On top of that there's some number of minor areas that include one or two stars each. In order to unlock a new major area, you collect a bunch of stars. In order to unlock a new minor area, you collect a bunch of stars. You can probably see a theme here. Can you fight the end boss? If so, go do it. Can you fight a midboss? If so, go do it. And this is one of the series's greatest strengths. There's never any question on what you should do next. You should go find another star. The game is carefully balanced so that, once you get past the first few stars, you always have several options on where to go next. If you get stuck on one particular zone, or decide that you don't really want to dodge fireballs today and you'd rather go play with flowers or space stations, you can always take a break and try another area. It's a brilliantly simple game mechanic, but unfortunately I think Mario Galaxy missed one of the things that made Mario 64 great. As I mentioned, most areas contain multiple stars. But in Mario 64, you can frequently pick up the "wrong star". Maybe you're meant to go ice skating, but instead you explore in the wrong direction and end up on top of the mountain. There's a star on top of the mountain, but despite the fact that the game said "Time for ice skating!" you haven't done any ice skating. That's okay. We can work with this. You can grab the star, and head back into the zone, and it'll say "Congratulations! You found the MOUNTAIN CLIMBER star! Your next star is: ICE SKATING." And then, when it would have normally said "Let's go climb a mountain! ", it just skips that one – after all, you already found the mountain star – and sends you off to fight a Yeti, or collect a ton of coins, or race a penguin or something. Many of which you could have done instead of ice skating or mountain climbing. In Mario 64, exploration is heavily rewarded. Each zone has several stars you can get at any point, and while you're encouraged to get the "next one", there's absolutely nothing forcing you. In Mario Galaxy, this is no longer the case. The vast majority of the time, only one star even exists in an area at a time. There are a small number of hidden stars – precisely one per area – but that hidden star only exists if you choose the right "non-hidden" star to go after. If you choose ICE SKATING you can get to MOUNTAIN CLIMBER also. If you choose YETI SLAYING you're going to go slay that yeti, or fail, and there simply aren't any other options. Have fun, good luck. And that's sort of sad. In Mario 64 I felt like I could just wander wherever I felt like. Some feature of the landscape look interesting? Chances are good there's a star there. Find a wall that looks challenging to climb, but still possible? Probably a star at the top. Whereas Mario Galaxy, once you choose what star to retrieve, is an annoyingly linear game. The exploration is gone, and for a game that balances right on the edge of having a glorious sense of wonder about it, Mario Galaxy stops just short of what I was hoping for. There's two other things I want to mention, but they're both pretty short. 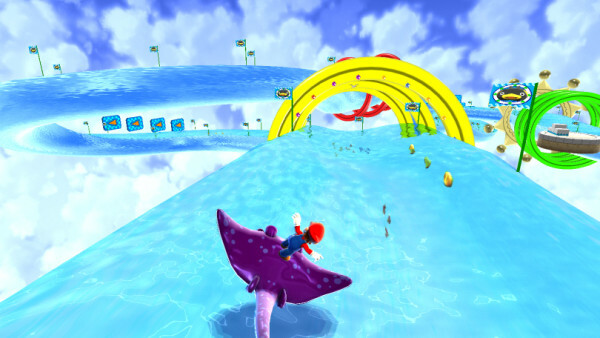 Like most Mario games, the developers have decided to spend the time to write quite a large number of minigames and game mechanics that only show up once or twice. There's a section with you balancing on top of a giant sphere, for example. There's a racing section with riding stingrays on top of a (completely awesome-looking) floating water course. There's a quite neat segment with "spotlights" that cause matter to exist – if you jump in an area without a spotlight, you fall endlessly to your doom. In fact, there are exactly two sections of each of these. Despite all the trouble that these are to implement, the game designers saw fit to only use the code twice, in the entire game. Partially this is annoying. Racing is fun. I want to do more of it! But on the other hand, it also neatly prevents burnout. I'm sure everyone reading this has seen a game which was fun at the beginning, but frustrating at the end. (Puzzle Quest is my most recent example of this.) Mario Galaxy doesn't do that. It doesn't even come close. "Leave the audience wanting more." There's no other way to say it, and there's no better way to get the player excited to try out your next game. After all, maybe there'll be more stingray racing! And finally, I noticed some neat subtlety with the music. The music actually changes depending on what you're doing – some tracks fade in, some fade out, and the music rapidly morphs to emphasize whatever you're currently doing. This is an amazingly powerful and beautiful technique, and I do not know why more companies don't do this. Nintendo's been doing this ever since the Super Nintendo (go jump on Yoshi in Super Mario World, the music is slightly different if you're riding Yoshi) and it's something I never see in other games. For a simple example, enter any Bowser boss fight – if you didn't notice this when playing, I recommend checking it out. It's worth it. Good game. Polished to a phenomenal level. Effort and money was spent on gameplay gameplay gameplay – not spectacular special effects, not a riveting plot, but on making sure the game was fun in every possible way. Game lacks the exploration sense that Mario 64 had, which I feel is a loss, but gets just about everything else right. 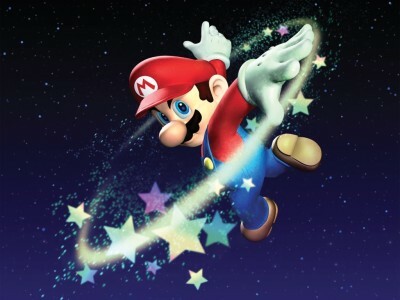 There's a reason Nintendo is doing well right now, and Mario Galaxy is a great example of it. One other game had the same idea to it as Mario 64…Donkey Kong 64 (taken to a crazy level). Of course, it was another N64 game, so…. I don't think I ever played that one. I should give it a try. It's a good game, but there are a few problems with it. Some of the characters seem like ethnic stereotypes. Moreover, they take the collecting game to absurd lengths, with about 20 different things you need to collect (pictures of fairies, coins, bananas, etc.) But it is a lot of fun. Of course, what it loses in exploration it makes up for in imagination. I was reading an interview somewhere, (I think it may have been one of the "Iwata Asks" interviews on Nintendo's website, but I'm not sure) and they described how Galaxy was different from Super Mario 64 in terms of level design. Basically, in Mario 64 they had to work all of the objectives into one level, which they described as a "garden", and had to make each of the objectives fit with the rest of the level. This presented some challenges and limited the amount of freedom the developers had with the game. It was difficult to include an idea that was really "out there" without making it a secret level, and there were never very many of those. In Galaxy, including a new idea is as simple as pointing a launch star in a different direction. This trade-off of exploration for creativity is also shown in the amount of stars in each level. In Galaxy, there are more levels but fewer stars in each, which again allows for more creativity, more variety in the level design. Oh and the music, I love the music. Nintendo does love to include interactivity with their music, so much so that it was a major roadblock in their acceptance of orchestrated tracks, (Once again, I read it in an interview, with Koji Kondo this time. He was talking about Twilight Princess.) as it's a lot easier to do interactivity with MIDIs. But it's always a great effect. Wind Waker's Great Sea music changes when you have your sail out, Twilight Princess's Hyrule Field music changes when you're on your horse, Chibi-Robo's music speeds up when you're carrying your plug, all these work very well in emphasizing something in the game, such as the character's motions or the epic scale of the landscape. Also, (going off on a mild tangent here) have you noticed that in any of the 3d Zelda games (assuming you've played them), the music that starts up when you encounter an enemy starts off as mildly foreboding, but as the music goes on it becomes more and more agitated, until eventually it's a full-out battle theme? It means that easy enemies, which get dispatched quickly, get music that gives a sense of mild caution but nothing else, and tougher enemies get music that escalates to a sense of tension that matches the tension you're feeling while trying to defeat this enemy. But it's more than that: it means the more skillful you get with the combat, the less you'll be worried about enemies, and the music will reflect that. i.e. A less skilled player will be very worried about fighting a wolf, and the music will reflect that by escalating to mirror their tension, as they will surely take longer to beat it. Meanwhile, a veteran will quickly end the battle, causing the music to be only a mild warning and nothing else. Wow, I wrote too much. And I wish they'd come out with the Mac version of Aquaria already. That does make sense – sometimes it's easier to see the downsides to a design decision than the upsides. I can see how merging multiple levels into one would be difficult and somewhat restrictive. Win some lose some, I suppose. The levels certainly were quite varied and well-built. I'm sort of curious if MOD music is going to make a comeback. With modern systems, MOD-style music should be able to produce nearly the same quality as orchestra music, while being much, much easier to manipulate programatically. Unfortunately almost no companies are doing interesting things with music right now (Nintendo is the only one I know of that's really pushing any sort of boundaries), which is sad because music is *really important*. Hmm, I haven't heard of MOD music before. Looking it up, if I've got it straight, it's music that is made up of prerecorded samples which are then played back in a pattern by the software? It could work. Or, similarly, what they could do is take an entire instrument track in a song, record it separately, and have the software decide when to play it. For example, in Zelda: Twilight Princess, the melody for the Hyrule Field song changes if you're on your horse or on foot, with brass and string instruments playing while you're on your horse and softer wind instruments handling it while you're on foot. The rest is kept the same. What they could do is record the brass and string melody, the wind instruments, and the rest of the song all separately, and layer them together in-game according to what the player is doing. The only problem there would be the people playing the instruments, which would have to deal with having only half the orchestra play. They would have to make sure the music fit together correctly and smoothly when layered. In fact, that's what they do in Rock Band, isn't it? They have the recordings of the bass, vocals, drums, guitar, and the rest of the music all separate, and they layer it together, apply effects to the tracks, (like the guitar's whammy bar and overdrive effects) and have the tracks stop playing if you mess up. So it's already been done, even, though doing it for an orchestra would admittedly be more difficult. I suspect that in cases like Rock Band they actually record the entire song together, with appropriate pickups on the instruments, then split it apart in postproduction – from the little I know of the music recording industry, most songs end up in dozens of separate tracks anyway. I imagine the same thing would be possible in an orchestra. The thing you lose with these approaches, and regain with MOD format, is the ability to recut and resample music in interesting ways. Yes, you can remove and add tracks – but you can't change the tempo or tone easily, and it's harder to do looping music, especially nonlinearly looping music. I've been looking for a game with a nonlinear soundtrack. Still haven't found one. I'll make one someday if nobody else does. It would be interesting to see a non-linear looping soundtrack, definitely. It would work especially well with open-world games. Imagine that: you wander through from a city to a cave area, and slowly, gradually, replacing instruments one by one, the music changes from an upbeat, urban song to a dark, menacing theme which tells you that it will be very dangerous here. Not too long ago Turbine (makers of successful MMO Asheron's Call) was experimenting with developing a very interesting music engine to be built into their then latest game-in-the-works Asheron's Call II (which I should note [no pun,] flopped terribly, RIP.) It allowed players to come together and play various instruments which would sort of intelligently blend together to form actual listen-able music. I don't remember all of the details, but this is when I personally really started looking for dynamic audio in games, and although to an extent it's become a lot more frequent (even DAOC changes music when you enter battle,) I agree, nobody has done it quite right yet.